From the 12th of December 2009 until the 17th of January 2010 the entrance will be allowed only to members. 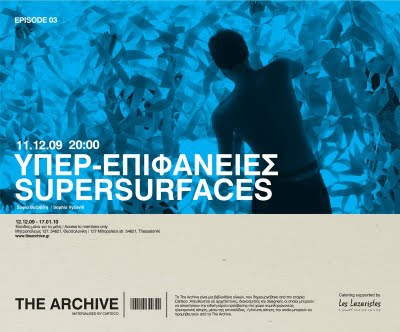 The third architectural event to be hosted in The Archive space takes us through a journey to the endless world of supersurfaces. They are compositions derived from folding and transforming a single surface of paper or other flexible material. The initiative and part of the show's material comes from the research work of the Special composition laboratory Supersurfaces taught by architect Sofia Vyzoviti at the Architecture department of the University Of Thessaly. An installation that is combined with the special characteristics of the space will be presented at The Archive. The opening of the show mark one more creative meeting of The Archive members. Carteco, the company behind this original space and supporter of the Episodes is bound to regularly renew these rendez vous by hosting architectural events worthy of our attention.